Below you will find the contents for the April 2015 edition of Website Magazine. 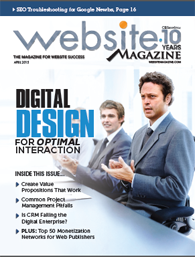 The feature article, "Web Design for Optimal Interaction" showcases some of the most popular, practical and powerful solutions and best practices for Internet professionals in pursuit of digital design success. As in each edition of Website Magazine, a wide range of topics (including Search Marketing, Web Design, E-Commerce and more), essential techniques and trends are covered as well. The April 2015 edition is distributed exclusively to our professional-level members (registration required - free). This issue is jam-packed with practical and experience-driven strategies from some of the tech industry’s top minds so take a look at the content below right now and subscribe for full access! Knowing users’ interests enables enterprises (and the digital marketers and designers they employ) to understand the optimal approach for securing a genuine user interaction. Designing an end-to-end customer experience on the Web - one that facilitates engagement and ultimately conversions - is no easy feat however. Find out how today’s savviest companies are providing digital experiences that introduce prospects to their brand in ways which accelerate their own ‘Net success. Today’s customers are in control of the e-commerce experience, deciding how and when they interact with a business. There is a reason why value propositions should form the cornerstone of a website’s conversation rate optimization (CRO) initiative – they are what make people buy. With proper planning and the right mindset, Web professionals can avoid the most common implementation mistakes with project management solutions. It’s old news that social media provides significant reach and spend value for advertisers, so why aren’t more brands flocking to it? Learn how to reduce sign-up friction, increase loyalty and encourage repeat visits by getting started with cohort analysis.